More than 5,000 investors on Robinhood ditched Tesla this week. The sell-off mirrors a decline in the stock’s price in recent months. 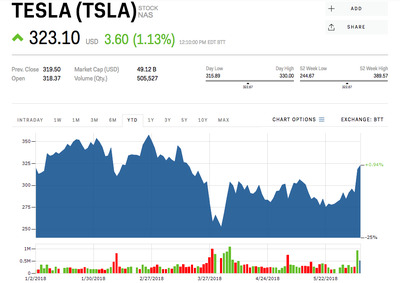 Tesla is up 10% this week following the company’s annual shareholder meeting. Until this week, Tesla’s stock had hit a rough patch. Last week, after steady declines in Tesla shares for most of the year, millennial investors began exiting their positions. Data from the stock-trading app Robinhood – whose user base skews markedly younger than traditional brokerages – shows that Tesla was sold more than any other stock on the app over the past week, with 5,087 investors exiting their positions. That’s more than any other company on the app’s most-held list, according to Business Insider’s analysis of the data. This week, however, the stock has reversed course and risen more than 10% following the company’s annual shareholder meeting in California on Tuesday. CEO Elon Musk told investors that the Model 3 was likely to hit its production targets, something the company has routinely missed, by the end of the month. He also announced a slew of other product updates. Still, Wall Street is increasingly worried that Tesla may need a cash infusion to stay alive. That’s in direct conflict with Musk’s prediction that the company will soon be profitable. Tesla is the 13th most popular stock on Robinhood, down one position from last week, with 82,391 investors holding shares.